Most cities today have no walls; they are usually protected from invaders in other ways. But back in the days of Solomon it was common to see a city with large walls built around it for defense. Without those tall, stone walls, much like what we would imagine circling a castle, a city would be completely vulnerable to attack. In the Old Testament we can read of a man named Nehemiah who realized the importance of city walls. When one of his brothers came to visit, he asked how things were going in Jerusalem. That’s when he found out the bad news. 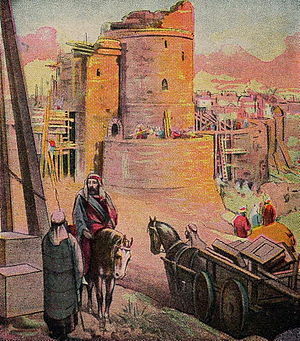 Later, Nehemiah went before King Artaxerxes, the kink in whose court he served, to ask permission to rebuild the wall. His request was graciously accepted, and the king even provided the materials needed for the job. However, none of this would have happened had Nehemiah not realized the humiliating and dangerous predicament Jerusalem was in. They needed walls. Solomon knew what he was talking about when he wrote this proverb, for he knew about human desire. But, as a king, he also knew about city walls and the need for defense. He recognized the similarity between a defenseless city and the undisciplined, careless soul. A person who has no control over his desires is like a city that parties away the night without any clue that an invasion is imminent. He with no rule over his own spirit is like a city full of treasures ready to be plundered. The one with no self-control invites destruction. Maybe it is time we share the burden of Nehemiah and repair the broken down walls in our own lives. This entry was posted on Tuesday, September 24th, 2013 at 11:04 am	and tagged with Book of Nehemiah, Book of Proverbs, Correction and Discipline, Jerusalem, Nehemiah, Old Testament, Solomon and posted in Armour and Weaponry, desire, Temptation, Warnings. You can follow any responses to this entry through the RSS 2.0 feed.